Callander is a popular tourist town situated on the River Teith and commonly known as the “Gateway to the Highlands”. It is on the border of the Loch Lomond and Trossachs National Park. A Victorian spa town that became popular due to the proximity of The Trossachs and Sir Walter Scott’s works including ‘Lady of the Lake’. The beautiful Bracklinn Falls and River Keltie have mesmerised people for generations. Travelling from the historic city of Stirling to the south, the town is known as the “Gateway to the Loch Lomond and Trossachs National Park and the Scottish Highlands”. There are fantastic walks available from the town: The crags with sweeping views over the town and beyond, Bracklinn waterfall, and the National Cycle Network Route 7 that follows the route of the old Callander to Oban railway. The town features a number of shops, including the Hamilton Toy Collection and Scottish Real Ale Shop, a golf club with 18-hole course, a leisure centre with pool and activities, and fishing is available on the nearby river. There is also a visitor centre in Callander where you will find information on local attractions and events. Bracklinn Falls are located at the east end of Callander and is signposted from the A84. The falls consist of a wooded gorge with stepped falls on the Keltie Water. The falls are signposted 3/4 of a mile from the car park. There is a vantage point right above the highest cascade. 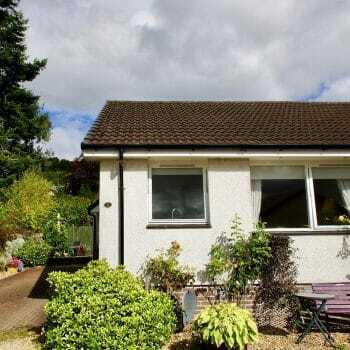 Callander Crags are a pleasant wooded walkway leading to steep crags with fantastic views over Callander, Menteith Hills, Loch Venachar and Ben Vorlich. There are many more picnic areas and walks to be found, many of which are located adjacent to the many Lochs in the area. The Trossachs trail starts at Kimahog, Callander taking you over Dukes Pass to Aberfoyle, a journey with spectacular scenery past Loch Venechar, Loch Katrine, Loch Achray, Port and Lake of Menteith where you can take a boat across the Lake to Inchmahome Priory, an Augustinian monastery dating from 1238. You may also enjoy a 7 mile journey through the Queen Elizabeth Forest Park. Did you know? In the 1960s and 70s the town featured in the long running UK TV series ‘Dr Finlay’s Casebook’ as the fictional ‘Tannochbrae’. Fishing – Many opportunities for fishing in the area. James Bayne located on the Main Street in Callander sells permits for river and loch fishing. Golf – Callander has its very 18 hole course. Other courses in Stirling, St Fillans, Comrie and Crieff welcome visitors. All within an easy drive of Callander, including the world famous Gleneagles course.